Heritage Ohio presented the “Best Committee Event” award to LakewoodAlive and the Downtown Lakewood Business Alliance for their “2014 Lakewood Wine & Craft Beer Festival”. The award was accepted by Allison Urbanek, Ian Andrews and Ken Brand on behalf of the organizations Tuesday, October 6th at Heritage Ohio’s Annual Revitalization and Preservation Awards Ceremony held at Historic Southern Theatre in Columbus. 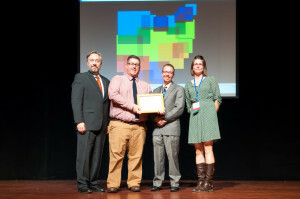 The Awards Ceremony is held in conjunction with Heritage Ohio’s Statewide Conference. This year, LakewoodAlive and the Downtown Lakewood Business Alliance hosted the 2nd annual “Lakewood Wine & Craft Beer Festival.” The unique outdoor, two story event was sponsored by Beer Engine. Lakewood Wine & Craft Beer is a celebration unique to Lakewood. It was conceived from the desire to bring in unrestricted funds to local businesses and to invest in ‘dream list’ items the city previously could not afford. With the help of two-hundred volunteers and over twenty committee members, this year’s Lakewood Wine & Craft Beer Festival enjoyed a successful sophomore run bringing in $25,000 of unrestricted funds without any complaints or injuries in the sell-out crowd of over 2,000 attendees.